Essentials of WRAML2 and TOMAL-2 Assessment introduces professionals to these two widely used memory measurement batteries, both of which measure memory and are used to supplement evaluations of ADHD and reading problems in youngsters, as well as a number of other disorders across the age span. Written by Wayne Adams and Cecil Reynolds, this essential reference provides administration guidelines, including procedural suggestions and solutions for common problems examiners may encounter; expert assessment of each test?s relative strengths and weaknesses; valuable advice on clinical applications; and illuminating case reports. Wayne Adams, PhD, ABPP, is Professor of Clinical Psychology at George Fox University in Newberg, Oregon. Cecil R. Reynolds, PhD, is Professor of Educational Psychology, Professor of Neuroscience, and Distinguished Research Scholar at Texas A&M University in College Station, Texas. He has written more than forty books. Both authors have coauthored numerous tests in addition to the two instruments covered in this volume. Two Overview of the WRAML2. Three Administration and Scoring of the WRAML2. Four Interpretation of the WRAML2. Five Overview of the TOMAL- 2. Six Administration and Scoring of the TOMAL- 2. Seven Interpretation of the TOMAL- 2. 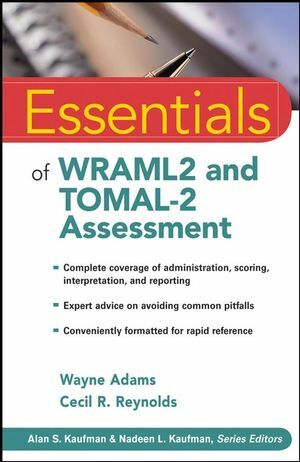 The authors are the experts on the tests covered in this volume: Cecil Reynolds is the author of the TOMAL-2 and Wayne Adams is the author of the WRAML-2. The TOMAL-2 test has recently published making this book a timely complement to its release. Utilizes the popular Essentials format and includes handy features such as "Don't Forget" boxes, "Rapid References," and "Test Yourself" questions at the end of each chapter.